During my research into the Bucks Constabulary I came across some interesting information with regard to one of the officers. Stephen Jennings joined the Buckinghamshire Constabulary on the 13th March 1923 as constable 199, he rose through the ranks reaching Superintendent in 1952. In March 1942 on his promotion to Inspector he found himself posted to Beaconsfield. 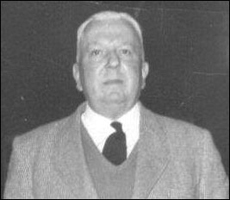 It appears that during one of his official duties he attended a meeting of the group organising the Beaconsfield Home Guard where he met a person by the name of Hugh Pollock. Hugh was married to Enid Blyton at the time and he introduced Inspector Jennings to his wife and over a period of time they became friends. 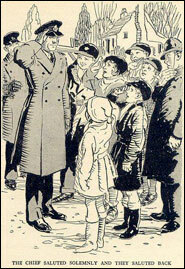 During the writing of the first book in the ‘Mystery Series’ called ‘The Mystery of the Burnt Cottage’ she decided to base one of the characters on Inspector Jennings, calling him ‘Inspector Jenks’ He eventually found himself in most of the fifteen stories in this series and, as he was promoted, so was Jenks. In her biography Enid described him as being “as broad and burly and kindly and shrewd and trustable as Inspector Jenks in the mysteries” and Inspector Jennings was “rather tickled” to be in a series of books and he enjoyed reading them, advising Enid on police procedure. 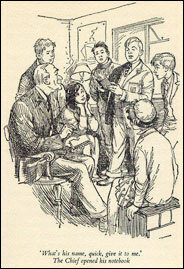 His only criticism to her of the stories was that he felt she had rather ‘overdone’ her portrayal of the other, entirely, fictitious policeman involved, the rather pompous and stupid Mr. Goon who all too often was outwitted and sneered at by the ‘Five Findouters’ Fatty, Larry, Daisy, Pip and Bets. During my brief research into Enid Blyton it appears she ridiculed her first husband Hugh, who she divorced in 1942, in the character of PC Goon who was also described as a Bumbling policeman. Imogene Smallwood, Enid’s youngest daughter, refers to Stephen Jennings in an article (mistakenly calling him Stephen Jenkins) “I can remember Enid talking about the real Inspector and in her view  that he was a benevolent authority who was also a partner in their mystery solving. Sometimes I find it hard to remember which Inspector came first! 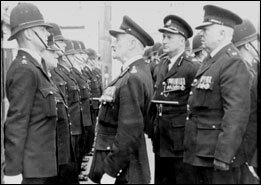 Superintendent Jennings’ last posting was to Bletchley in 1952 and in 1953 he received the Queen’s Coronation medal. He retired during the latter part of 1959 and I have no doubt that he continued to read all the new Enid Blyton books during his retirement. Enid Blyton, was born on the 11th August 1897 and her last book was published posthumously in 1975. She wrote over 600 books in total. Some of her books have caused controversy and have been criticised for racism, sexism, and snobbishness; she died on 28th November 1968 in a Hampstead Nursing Home. Her most popular series were the 'Adventure Series', 'Barney Mysteries', 'Secret Series', 'Malory Towers', 'St Clare's', 'Faraway Tree', 'The Five Findouters' and of course 'The Famous Five' which became a television series and 'The Secret Seven', and not forgetting 'Noddy' created in 1949, and of course mentions the infamous 'Mr Plod the Policeman'.